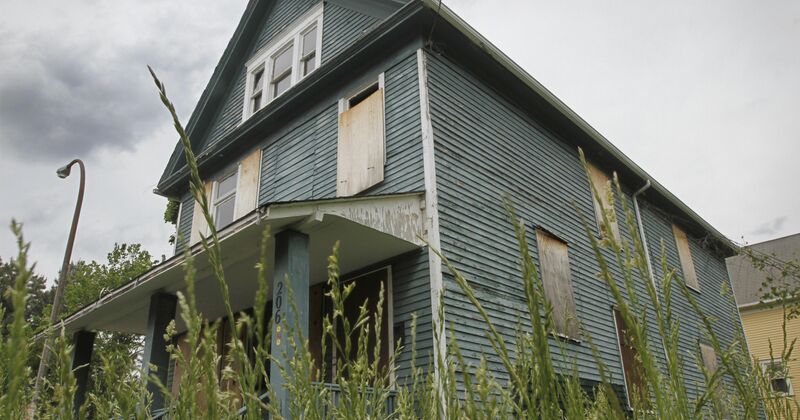 Abandoned and orphaned houses continue to blight our neighborhoods and drive down property values. These so-called zombie houses are eye sores, magnets for crime, a public safety hazard, and a tragic waste of resources. There is a group working on developing short and long term solutions to this issue for the JWN and Eugene in general. If you want to get involved, contact the JWN. 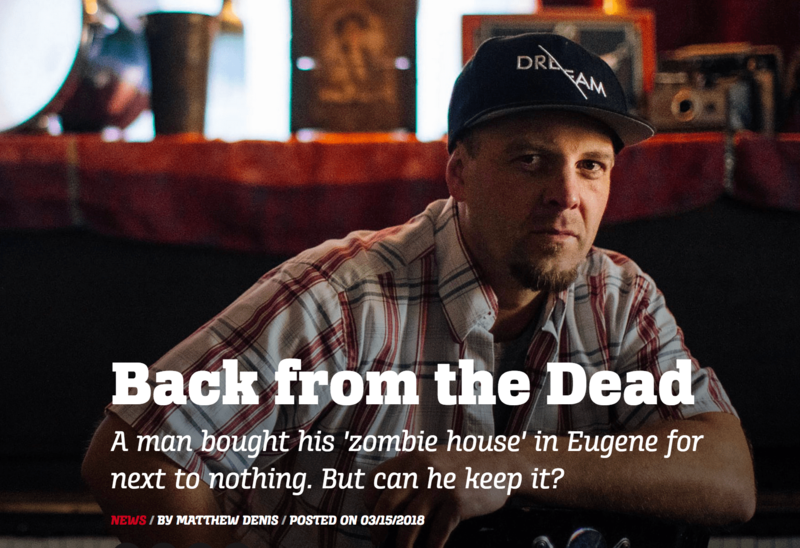 Jonathan Baker bought his house in Eugene’s Jefferson Westside neighborhood for a dollar. The previous owner’s husband had died in 2010, and after 18 months of disagreement about mortgage payments with JP Morgan Chase Bank, she abandoned the house. From 2012 to the end of 2015, the house lay vacant, wasting away, undead — a zombie house…. The JWN Zombie House Team is crafting a plan to mitigate current and future zombie houses. In the meantime, if there is house near you that appears to be unoccupied or you know has been foreclosed, there are a few things you can do to keep it off squatters’ radar. Check “select address from list” and type in an address. Select the address from the list that comes up and click “view”. If there’s more than one listed you may need to sort through them one by one to find the target property. From there you can select “view current property tax statement”(list of all the stuff you can look at is on the left) which should always show (among other things) the site address, a record owner and their mailing address, and name of any mortgage company if the mortgagor pays the property taxes. Select “get the current balance due” to determine whether taxes are delinquent. Select “find prior year tax statements” to track mortgage company changes (common in cases of mortgage delinquency). NOTE: Deeds are not accessible on line. You have to go to Deeds and Records at 125 E 8th Ave.
A Trespass Letter of Consent (TLC) is a specifically worded, legal document which allows a police officer to take enforcement action, on the property owners behalf, without contacting you first. Police officers do not have the authority to go onto private property and remove individuals or request them to leave without the consent of the property owner. If an officer observes someone on private property, when the business is closed, or a problem is called in by someone who does not have the authority to sign a trespass complaint, EPD must then contact the person who is legally responsible for the property. A Trespass Letter of Consent gives Eugene Police officers permission to act on the property owner’s/manager’s behalf, in trespass situations. Third, take direct action to make a house look occupied to keep squatters and scavengers away. Please note while it is always dicey to do anything with someone else’s property, not only are you helping the current/future owner but avoiding a possible nightmare if squatters move in. Once a house has been squatted it is difficult to keep people out. Still, this advice is carried out at your own risk and you should decide what you are willing to do to keep a property viable until it can be bought and reoccupied. The last thing you want are boarded up doors or windows, which are more of an invitation than a deterrent. This is for informational purposes only and the JWN does not endorse any actions that may contravene the law. Keep the house under surveillance. Talk with the immediate neighbors and keep in contact with each other. While you should never confront squatters or trespassers, you can make it clear people are paying attention. Keep the yard clean and kept up. Trim shrubs back so the house is visible from the street. Sweep sidewalks, rake leaves, and keep the curb gutter clear. Make sure no mail, flyers, phonebooks or other items accumulate on the front porch. Talk with your neighbors and have one or more people park a car in the drive way. If you want to be really tricky, add a few seasonal decorations, just make sure to take them down after the holiday! More active steps can include directing lights from neighboring properties onto that property or installing a cheap flush mount motion detection battery powered light on the porch or back yard. You can also make sure gates or any backyard access points are kept closed. If there are multiple gates you may wish to “pin” them closed with a nail slid through the lock hole. This will make the gate seem secured. You can also post “no trespassing” signs on fences. All these steps take time and/or money and, of course, you should not be the one dealing with it. However, a zombie house can be a horrific experience if it goes bad and any actions you take will seem easy and cheap by comparison. Help the JWN address this complex issue by letting us know of any boarded-up or seemingly abandoned houses in your area.